Poll: Does this approach to ships with cargo holds sound feasable? (so typos will unfortunately be a thing here and there). part of your construction is your ship and which part is the pier? 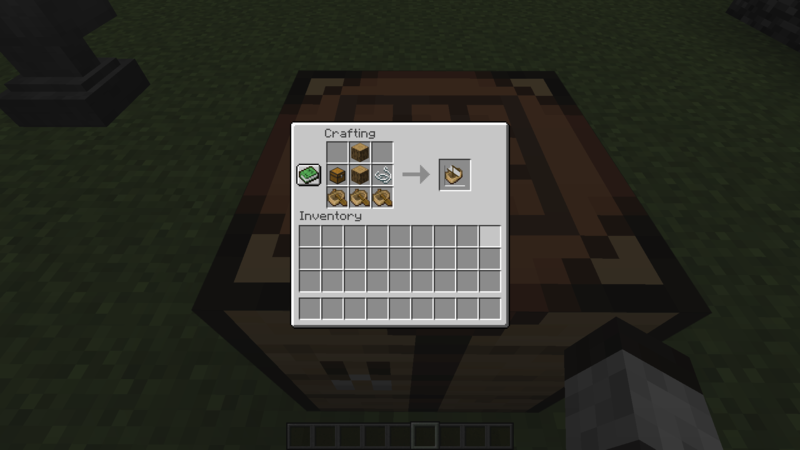 (or partial functionallity for blocks like workbenches/furnaces etc. people would be happy with at least something more than a rowboat. I came up with a compromise. and we want to keep things as simple as possible). aforementioned vehicle it will come in all wood variants. So what is different other than speed? First: -It takes more resources to craft (see pic/fig.1). (7.5 m/s so same speed is riding the donkey). there should be some drawbacks to not make boats obsolete^^). Fourth: -It has an Inventory slot like Donkeys and Lamas but travels on water (I decided it should have the inventory size of one chest). That's all nice and such...but what will these 'ships' look like? Will they be massive and customizebale? Well... No and kind of yes. sometimes has to make way for balance or technical limitations. what these ships would look like in the end (see pic/fig.2 and pic/fig.3). standard white sail rigging (white banner here). Thx to Scotmiser for that suggestion. WASD controls with pressing E to access the inventory. together to make it look kind of like little ship like thingies). feedback in regards of balancing or possible exploits, cost etc. of what I have written so far. I know... my text formatting is attrocious. I'd prefer to see the sails carry over the banner pattern rather than using the leather armor dyeing colors. Standing the player where the chest is shown in the mockup would not only place him in the usual position for a helmsman, but would require greater vertical clearance than sitting in a boat – further differentiating the ship by making ships more suitable for open waters and boats for tunnels etc. Making a placed ship impossible to retrieve in item form (rather like a mobile cake ) was an inspired downside to offset its advantages. A single hit from an unenchanted trident does 9 HP. Assuming ships heal as boats (2 per second), a second hit within 4.5 seconds would break a ship – which seems excessively squishy. 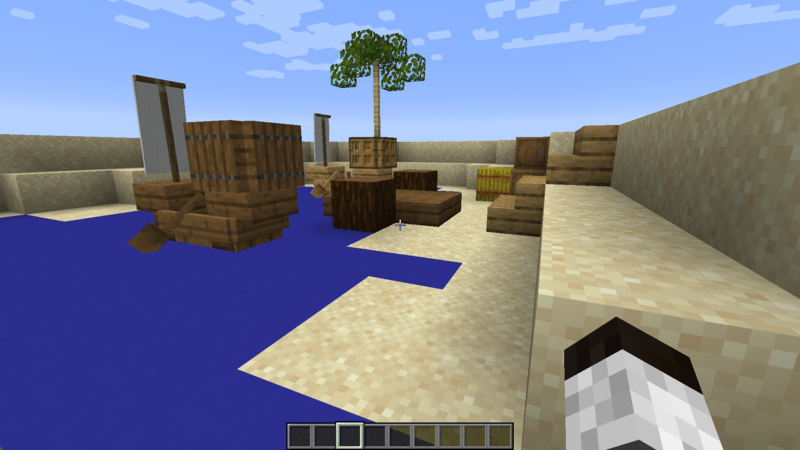 Unfortunately, I don't see a good solution to this: importing the Bedrock ability for a boat to "float again when it emerges from the current or the waterfall that is keeping it down" would seem to require major reworking of the game code, but allowing down bubble columns or running an edge into downward flowing water to permanently disable the vessle seems excessive. No weapons (other than player fired) seems quite reasonable given the intended model. At present MobB makes really long journeys by boat (and, by extension, by ship) impractical. How much work would be entailed in having being in a ship be treated as being under a solid block is unknown to me, but might offer a solution to this problem that further differentialed ships from boats. You know what? Pretty much all you said seems like a good idea. Guess I'll change the HP to 24 and replace the banner in the crafting recipe with two logs of the specific wood...and a string next to it. The idea with the extra banner slot sounds nice...I'd make it so that the sails are in a fixed position and as long as you don't put a different banner of your choice into the sail slot, it will show the bog standard white sails instead. Also...yeah. No reason for the chest to actually be visible. So the player could actually sit there whilst the passenger sits in the middle. Well, assuming the hostile mob isn't able to attack you while in the ship you could but a blaze in the back and use it as a turret to defend from enemy players. Also, I like how this both satisfies the need for a boat while not feeling like a mod. Assuming this would be used for long term boat trips. Insanity would be a pretty big problem. Perhaps, you could sleep in the boat but in my opinion that's a little too mod like. Another thing would be a musical instrument but that has the same problem. Without reading the post (sorry, pretty long), and going off of your pics, I think another solution would be to be able to make pull boats, which would be something along the lines of crafting a boat, chest, and lead together, and being able to attach that to your normal boat, up to 3 or so. That’d be cool too.